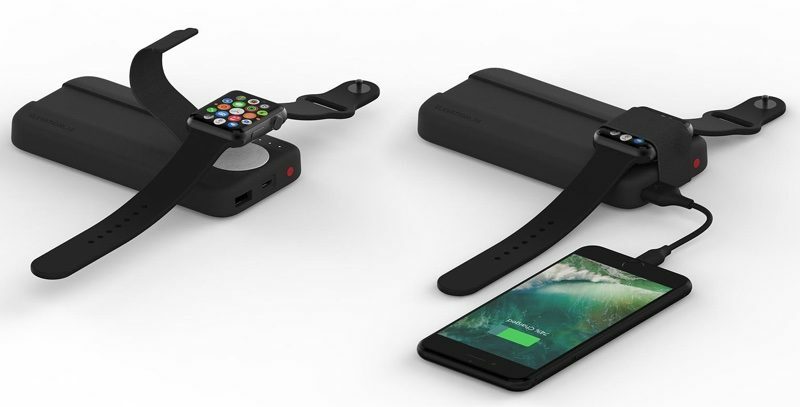 Elevation Lab today introduced its latest product, the BatteryPro charger that's designed to be an on-the-go charging solution for both the Apple Watch and the iPhone. The BatteryPro features an integrated Apple Watch charging puck, so there's no need to supply your own Apple Watch charger, and it has a USB-A port (and included cable) for charging the iPhone. At 8,000 mAh, it's able to provide more than two weeks of Apple Watch charges or three days of charges for the iPhone 7. 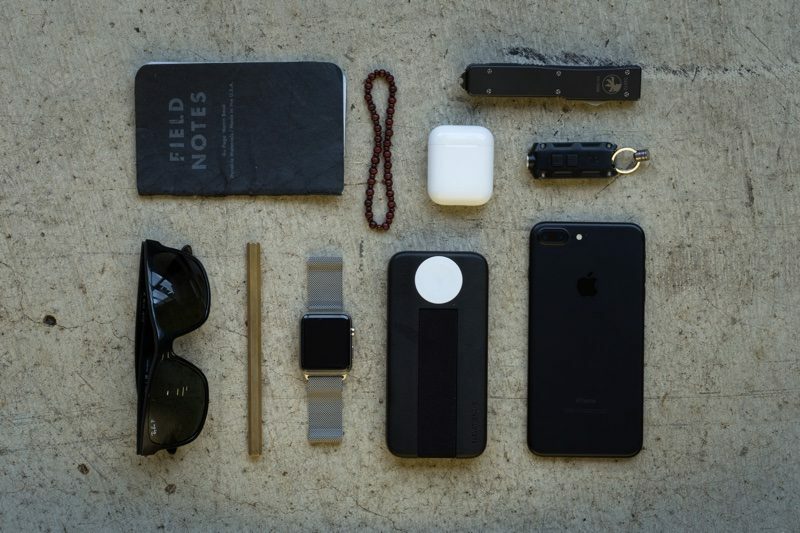 It supports full-speed iPhone and Apple Watch charging, with an integrated Apple-approved StowStrap that locks the Apple Watch to the charger so it can charge securely regardless of where the BatteryPro is at. Design wise, it's similar in shape to an iPhone 7, but thicker, and it fits well in a back pocket. LED lights indicate charge level, and the BatteryPro itself can be recharged using micro-USB. It can lay flat for charging, but there's also an option to balance it on its end to use the Apple Watch Night Stand mode. Elevation Lab is offering pre-orders for the BatteryPro on its website starting today, with shipments to begin on June 1. The BatteryPro retails for $99.00, but during the pre-order period, a 20 percent discount is available using the POWERUP code at checkout. I like how $99 for a potentially best in class watch / iPhone charge solution is too much after spending $700 - $800 on the phone and $300 - $400 on the watch. The strap is a good idea, I have the Belkin Watch charger and you basically have to keep it still with the sport band on. And the usb out charges super slow. Hmm, could you point out on that RAVPower battery pack where the built-in watch charger is? There are a lot of good battery packs out there for great prices. I'm a fan of Anker's line. But this is something different, with the (expensive) watch charging puck built in. Not something I need, but trying to assert that the legion of good low-priced battery packs out there equal this in features seems silly. $99 is far too expensive unless a big portion of their money is going to the MFI program for including inductive Apple Watch Charging? This is exactly the issue. The cost of the MFI charging puck is exorbitant. I have become very familiar with battery packs with USB ports and I have two 10K MAH that I travel with each with a USB-A port. I just have a USB Multi-port hub and plug everything in to one pack. These run $20-$30 for ones from reputable brands. $99 is absurd. I wonder, at this point, can they get the charging puck as a part directly from Apple officially, or are they buying Apple Watch chargers at retail in quantity and then cutting the puck off the cable? They are available through the MFI program, but Apple only has a couple of suppliers authorized to manufacture them and they are not cheap by component standards. Just give us a watch recharging puck with a lightning port instead of a fixed cable!